A spoof video of Donald Trump and Hilary Clinton by Dutch satirist Sander van de Pavert has been picked up by US television networks and has been viewed millions of times. 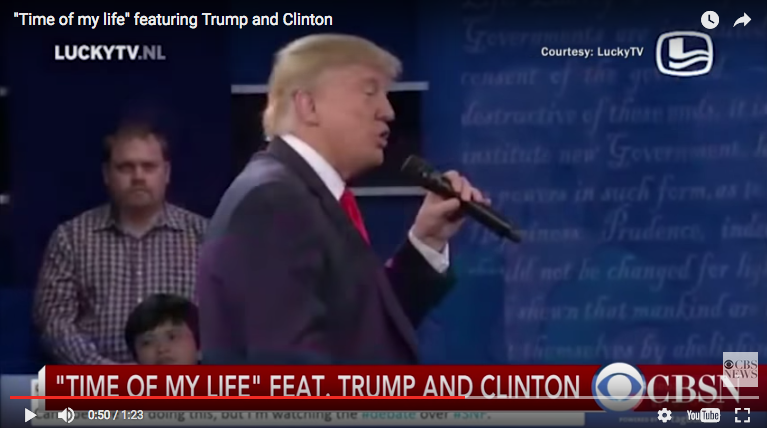 Van de Pavert of Lucky TV, who makes short videos for chat show De Wereld Draait Door, used footage of the two presidential hopefuls in debate and set it to the song Time of My Life from the film Dirty Dancing. US television station CBS was the first to pick up on the video, which led the presenter to conclude ‘some people have too much time on their hands’. The Huffington Post website dubbed the video the ‘best so far in the election campaign’ while Buzzfeed said it is ‘amazing’. The success of the clip crashed the BNN/Vara website for a time on Monday night as people tried to log on and watch it. Van de Pavert told news agency ANP he got a great kick out of the publicity but that ‘the clip could have been better’. Lucky TV also produces a string of successful videos featuring ‘Willy and Max‘.